Both these volcanic mountains are still extant and dominate the landscape. The signature of the region, the 'fairy chimney' is formed when a cap of resilient stone protects the column of softer material beneath it while the surrounding tufa is removed. The area is now a warren of caves, underground cities, rock churches and chambers and it's almost certain that there are more such sites waiting to be rediscovered. 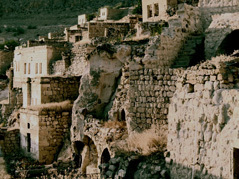 All that said, Cappadocia has gone under an enormous transformation during the last 40 years. As a well-known historical site, it combines the rare beauties of nature, culture and human creativity. However, with the influx of thousands of tourists all over the world to the region, the texture of life has changed at times beyond recognition. Today, it is very hard to find a traditional, true cave-dwelling in any of the major towns of Cappadocia, which is not already transformed into a pension house or a modernized summer residence. Most of these new built houses hardly respect to the old characteristics of the local, vernacular architecture. 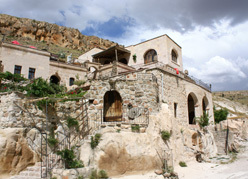 Building forms of former times, which had been different as one travels from one Cappadocian village to the next, are increasingly replaced with standard construction and decor elements without paying attention authentic ways of doing things, using local materials, and of course the centuries long traditions of masonry so unique to the region as a whole. 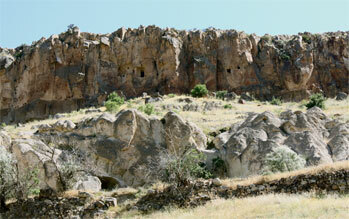 The result is a rapid loss of the particular historical character of different Cappadocian towns and villages. I first arrived in Akkoy, Cappadocia as an international law professor from Canada with my young family in the late summer of 2008. The village is located 11 kms north-east of Urgup, and the winding roads that lead to the Cave House we were going to stay at were intriguingly obscure and yet welcoming. At the time, I already knew that many of the local cave dwellers of traditional Cappadocian rock-villages have been either moved to new, subsidized houses provided and planned for the local population, or, villagers themselves deserted their ancient dwellings and ways of life and moved to nearby towns for a better life and jobs. There were indeed three ‘emptied’ stone and rock villages on our way to Akkoy, each more eerie than the other with hardly a handful of people still remaining in these surreally beautiful clusters of ancient houses, graveyards and arches. Since the 1970s, rapid urbanization, modernization and the extensive growth of the tourism market as well as the allure of new building materials caused dramatic changes in these villages, and for the most part, led to their decay and total deterioration. Yet, Akkoy was strikingly different. The immediately observable decay of traditional, vernacular cultural wealth and the disappearance of unique Cappadocian building styles were not applicable to this village. It was, truly, like an open air museum. What is more, it had real people living and farming in it. Unbeknownst to me at the time, this was the beginning of a long journey for me, and my dealings in Akkoy. Fast forwarding a year, I am now a property owner in the village, and a business partner for Mehmet Gulec, the owner and founder of the Akkoy Evleri we originally stayed at as a family. I have an incredibly talented team of masons turning my own cave home, Uvercinka, into a Museum House and a Children’s Library to be opened in summer 2010 as a philanthropic enterprise. I named it Uvercinka, suitable for a region known for its love of pigeons (guvercin in Turkish). My house is particularly designed as a family residence, fully furnished for long-term stay. It will offer a perfect escape for artists, writers, musicians who wish to hold workshops, master-classes or run writing and creative arts sessions. I also began making freskos on the cave walls of Akkoy Evleri, the Cave Hotel, and we are starting a winery business together with Mehmet. But why would I take the risk and invest time, energy, love, compassion, and cash, to this esoteric, ancient mountain village removed from all else except the timeless routines of communal village life, crop cycles, silent and mostly empty cave houses, and quiet roads leading to sleeping wine yards up on distant valleys? As I made several new visits to the village between August 2008 and now, I learnt that Akkoy is a very ancient settlement that hosted Hittites, Asurians, Seljuks and Ottomans in its long history. 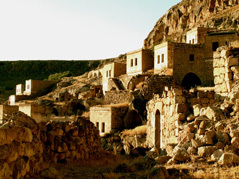 The village's unique vernacular architectural style is readily observable in the stone houses carved into the volcanic rock formations. The village as it stands was given its final shape during the 1920s and 1930s by local craftsmen who created a spectacular vista of terraced streets and cubic stone houses fully equipped with cave storage rooms, sun roofs, open kitchens and multiple chambers. 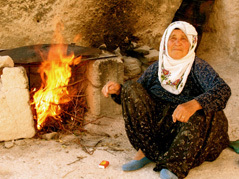 Once populated by hundreds of people and beaming with activities and trade, today Akköy has become one of the three adjacent ancient mountains villages in the vicinity inhabited mostly by the elderly. The first wave of labour migrations from the village was to Germany during the 1960s, followed by the second and third waves to Turkish cities and again abroad. Today, the remaining population of 80 to 100 people is proud of their ancient settlement and protects and look after their village for future generations. The civil architecture of the village is preserved untouched. The unmatched beauty of the rows of sand-stone houses carved by local masons is a sight to be enjoyed on its own. The villagers also continue to till the land and engage in animal husbandry and horticulture keeping to seasonal routines, which allow visitors to engage in biotourism activities first hand. The village has a unique graveyard that keeps to the Hittite tradition of collecting and preserving the bones in a pile in order to open space for new burrials. The guests to the village are truly welcome to spend time with the villagers, visit their households, the communal coffeehouse, and join them in their yearly activities. That is why; part of our yearly routine of moving from Canada to Turkey now includes a family stay at Akkoy. 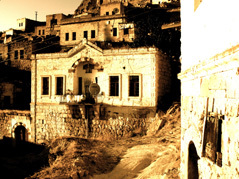 Both Uvercinka and Akkoy Evleri Cave Hotel's commanding location give the visitor the full view of the ancient village of Akköy as well as the surrounding valleys and mountains with three other rock and stone villages in sight, fertile fields, and the unique landscape of Cappadocia. The whole place is marked by its serenity, comforting hospitality, the unique and the magical features of the village. The area around the village offers superb opportunities for historical site-seeing, photography and nature hikes, and of course, biotourism. In terms of accommodation, the quality of the cave rooms make you feel cool in the summer and warm in the winter. Volcanic rock called "tuffa" is perfect insulation material. It keeps the temperature between 17 - 20 degrees Celsius throughout the year. All rooms at Uvercinka as well as at the Village House are different from each other in their size, shape and qualities, but they each have the signature curves, texture, cupboards, fireplaces, arches and decorations characteristic of the village’s local civil architecture. All rooms are traditionally decorated and the cotton covers, carpets, kilims, wooden furniture, etc. are locally produced. However, each room also includes private stone shower and w/c, some rooms even a jacuzzi, constant hot water, comforting wooden floors, and a must for an international academic, internet service. What is more, in Akköy, this summer myself and my young boys enjoyed natural life and tasted the fresh organic food from our own garden and the fields and wineyards laced around the village. In the kitchen, the food is prepared fresh every day, entirely from locally grown ingredients and depending on what is available in each season. The cooks are villagers themselves who prepare standard regional favorites as well as special treats for holidays. The village and its immediate environs allows for direct participation in organic farming, as well as seasonal activities as the villagers harvest the produce from the fields and orchards. The villagers are also expert collectors of mountain produce, such as select mushrooms, herbs and berries and the visitors in our hotel are most welcome to join in these communal activities. The harvest is then processed for the year, as grapes are squeezed into extract and dried to paste, wheat and other grains and processed through traditional means to make pesah (dry/yeastless bread) for the winter months, jams and preserves are boiled, and fruit and vegetables are lined up to be dried under the sun. There are also activities for those who suffer from specific ailments such as romatism and arthiritis that the villagers themselves are accustomed to for many centuries. The best cure for any chronical pain caused by rheumatism, arthritis, fybromyalgia, skin disorders, digestion problems, respiratory disorders and more is the natural waters and hot-water pools available in the area. The village itself imposes nothing on the visitor or guests as there are NO shops to sell anything, or no merchants at your doorsteps. The idea is for one to rest, enjoy the air, the sun, the quiet, and the history and life style that comes with the village itself. However, on the weekly market in the nearby town of Urgup, we also saw many different kinds of merchants, farmers from the mountains who come to sell their fresh fruit and vegetables, herbs, as well as unique samples of ironware and textile. Since its restoration and opening in 2003, Akkoy Evleri hosted many unique guests from all corners of the world including archeologists, nature lovers, architects, diplomats, engineers, doctors, students, teachers, photographers, professional mountaineers, artists, and more. They arrive from many different and unrelated locations, including Japan, Korea, many states in Africa, all over Europe, Canada and the United States of America, as well as Australia. In that, I take comfort and justify my rather unusual decision to spend part of my life in a distant mountain village in Cappadocia, where I am the only urban person and a non-local, while feeling truly at home in our new home, Uvercinka. These long months of the winter come with plenty of sunshine and white snow to the valleys and hills surrounding the village. For those who may be tempted, there is plenty of small game for hunting in the environs of the village, as well as the possibility of nature walks with special winter shoes used by the villagers. In the evenings, it is a delight to gather around the wood stoves and fireplaces in your room and the hotel’s central areas and restaurant, to eat barbecued potatoes and local vegetables. The local village café is a welcoming spot for long evening chats, drinking tea and coffee and sharpening your back-gammon and other Middle Eastern game skills with the villagers. The nights are crisp and quiet, with an early morning sunrise always welcoming you to the new day. With the arrival of spring, the outlook of the village changes entirely. The stone houses and pavestone pathways are now laced with the spring bloom of apricot, plum and almond trees. The fields are filled with the buds of narcissus, anomone and other rare mountain bulbous flowers. The villagers engage in communal clearing of the fields and pruning of the fruit orchards as well as tending of the wineries. Our guests are welcome to work along the villagers, as well as enjoy guided tours of the spring brooks, rare plants in the valleys and mountains, as well as bird watching and other calm activities to enjoy the spring weather and sunshine in full. The best gift of the month of May is the early crop of fruits that nature gives us. Plum, apricot and almond trees have special green fruits that the villagers, especially the children, really enjoy. This is also the time for communal mushroom picking activities in the mountains. This ancient habit equips the villagers with a much appreciated delicacy for their local cooking practices. Our guests are welcome to join us in learning the different kinds of edible mushrooms growing in our mountain village as well as the myriad recipes used to enjoy their rare taste to the fullest. While the work in the agricultural fields had slowed down in April and May, june is the month when the bulk of the work for organic farming takes place in the village. The fields need regular tending, watering and upkeep until the harvest time. June is also a special month of festivities. At the third week of the month, there is the annual Rice Festival of the village, whereby the whole community goes upto the mountain tops, eats, dances and plays traditional instruments to celebrate the summer and the upcoming harvest. Our guests are most welcome to take part in these ancient festivities and enjoy first hand the beauty of communal traditions of Asia Minor. In this month, fruits and vegetables ripen and are ready for harvesting. Our guests are welcome to join us in collecting the gifts of nature in the many fields we have in the environs of our village, down in the valley, up on the mountains tops and along the brooks running through the village itself. This is the Harvest Time, when all the hard work of the year comes to fruition. The villagers are now in the fields, collecting the goods and gifts of nature, working hard in teams, when entire families and several generations work side by side. All the harvest then gets carried into cave storages. Big wood fires are built to boil the fruits and grapes to produce the precious extracts and to make yearly preserves and jams. Nuts such as walnuts are harvested for yearly consumption, broken and stored in cotton bags. The local delicacies of sun-dried apricots are bagged for winter months and fruit and vegetable composts are prepared. This is practically the best season to join the villagers in their agricultural activities as the autumn season slowly sets in. Preparations for the long winter season starts. In the households, villagers make yeastless bread and special baked goods for storage. Wood is collected from the valleys for the long months ahead. Seeds are brought to the fields and the villagers make the preparations for next year’s crop by tilling and turning the soil before putting the seeds in. This is a wonderous time when the light turns orange, and long nature tours and walks in the area allows the enjoyment of the crisp mountain air and the changing colors of the local trees for our visitors. Our visitors are also most welcome to join the villagers in their winter preparation activities.